← Panel Gallery: Avengers Assemble! 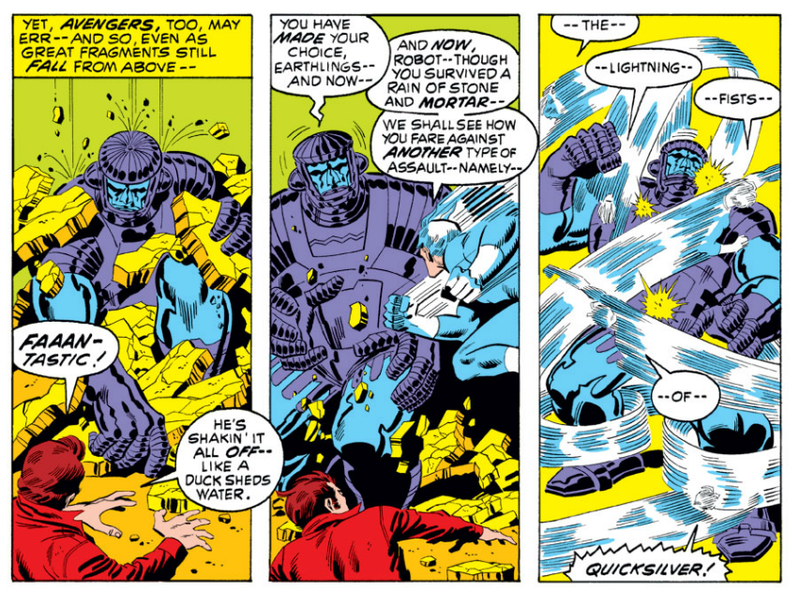 I thought the Avengers‘ Kree/Skrull War was one of those events, especially with an Avengers movie due any day (and with the movie featuring an alien invasion of some sort). But no dice. My twenty-something office pal — who loves comics, and previously borrowed my copy of Avengers #196 to read the origin of Taskmaster — had never heard of the Kree/Skrull War! NEXT WEDNESDAY: #47 Avengers Assemble For The Ultimate Marvel Marathon! Posted on May 2, 2012, in Reviews and tagged Avengers, Captain Marvel, John Buscema, Kree, Kree-Skrull War, Mar-Vell, Marvel Comics, Neal Adams, Roy Thomas, Sal Buscema, Skrull, Vision. Bookmark the permalink. 63 Comments. This is one of my all time favorite story arcs! Great stuff, and way ahead of its time. I re-read Avengers #1-300 a couple of years ago (thanks to both Essential Avengers and my own back issues) and I think Roy Thomas’ run on the Avengers was probably the best Avengers run, though there were actually several really good runs on this title. My one criticism of the arc is the ending, which seemed a bit flat to me. 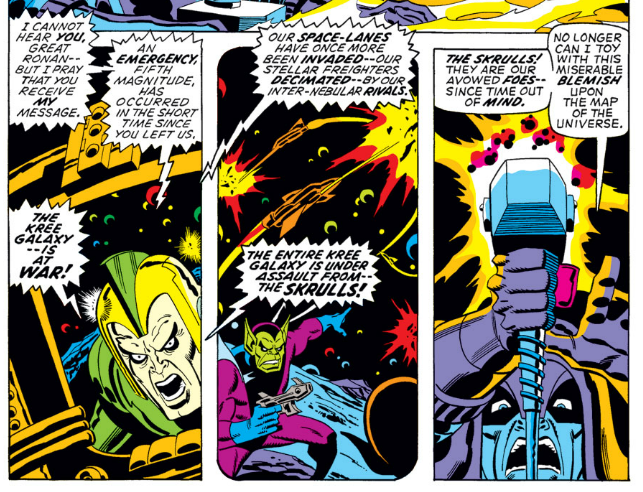 However, since you wrote that Roy Thomas didn’t really have a plan for the Kree-Skrull War, I guess it’s not surprising that the ending wasn’t that great. Still, the buildup to the end was excellent. The art was very good too, though they did shuffle artists more than I’d like. Regarding Neal Adams, he is my second favorite artist after George Perez, so it’s always a treat to see his work. Adams and Perez are kind of cut from the same cloth, with their realistic anatomy and detailed scenes. The Grim Reaper story that Perez penciled around issue #160 of so of the Avengers is a personal favorite. 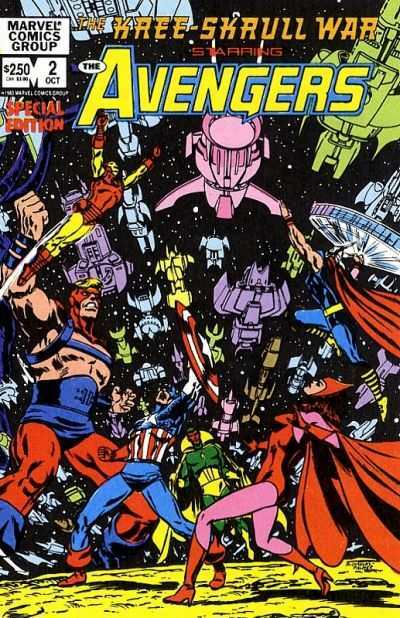 I think the best single run of Avengers stories is the Thomas/Buscema Ultron/Vision/Yellowjacket arc starting with #54. Maybe I’ll use the release of the Avengers movie on DVD as an excuse to review those later this year. I was thinking that, of the Roy Thomas run, that particular story was my favorite. “Even an android can cry” is forever burned in my memory. Your mention of #160 reminds me that #161 was my first even issue of the Avengers. It’s the one with Ant-Man battling the Avengers on the cover. I can picture the Scarlet Witch writhing on the ground with ants crawling all over her as I type this! And of course George drew every … single … one … of those hyper-detailed little ants. That guy must go through two pencils every page. 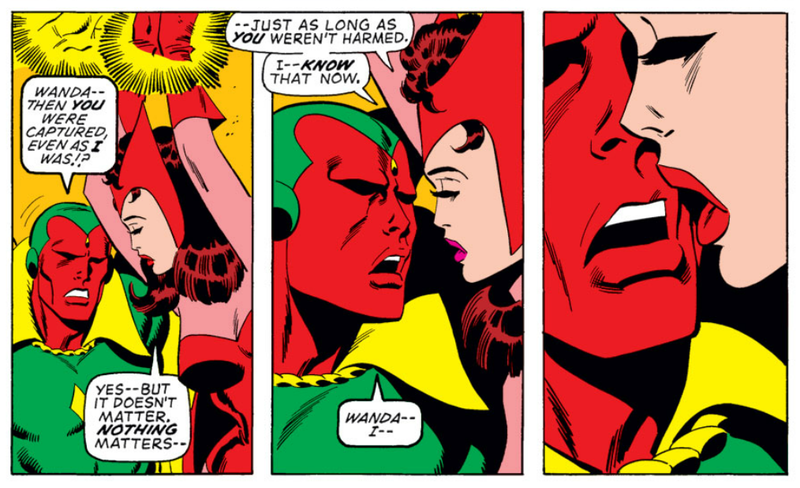 Avengers #160-162: The Bride of Ultron saga. One of my favorite Avengers stories. Jim Shooter really understood these characters. Wrote some amazing stories before he became Editor-in-Chief. 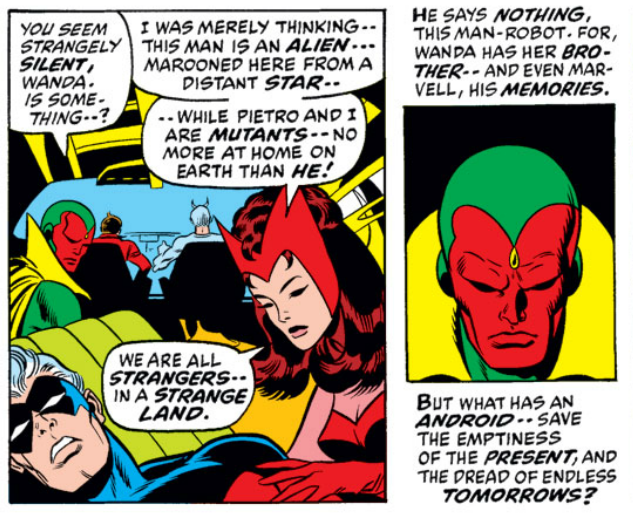 There was an Oedipal undercurrent to the Ultron story right from the get-go, and as I recall that Bride of Ultron story took all that subtext and put it on the outside. Normally I’m put off by that kind of “reinvention” but I did like those stories and now have an urge to read them again. This is lost with modern comics. And, it’s a reason why I don’t buy (endorse) them anymore. Yeah, I took a long look at Avengers vs. X-Men, but ultimately decided I couldn’t tumble to $3.99/issue for a digital book (or print, for that matter). Secret Wars and Crisis were exciting in their time but they’ve left a pretty foul legacy. I left comics shortly after Crisis so I missed the worst of them. 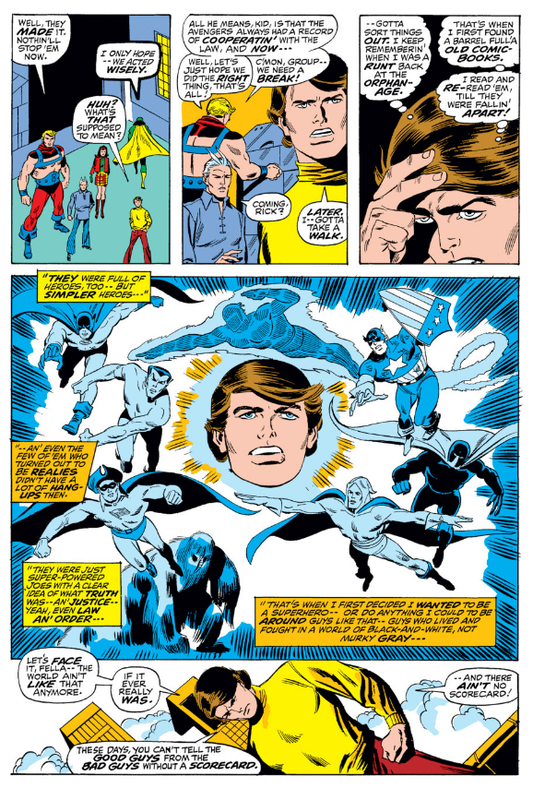 I might try House of M or Fear Itself — just because they’re sitting there in my Marvel Digital Unlimited sub — but right now I’m having too much fun reading classic 1960s Avengers. Great summation of Avengers #89-97, Paul. Nice that some people are actually looking at the comics in anticipation of the film. For my part, I am committed to the Marvel mega-movie marathon tomorrow … five superhero pictures in one sitting, then Avengers at midnight. It’s hard to calculate how it has come to this … that the Avengers, of all things, is tracking to be one of the biggest movies of all time. From a pre-Star Wars, 1970s perspective it’s practically incomprehensible to accommodate to what degree we happy geeks have won the pop culture war. Revenge of the Nerds indeed. Here’s an interesting factoid for you, though. The sales of Avengers in 1979 outdistanced today’s book by a factor of two or three. That’s right … the Avengers movie could crack $500M worldwide gross this weekend — superheroes are bigger than ever before — but the comics business is still struggling. It’s like they’re starving to death in the middle of a supermarket because they can’t figure how to use a can opener. But I’ve already ranted about that. For now I’m just looking forward to seeing the movie tomorrow. My twelve-year-old, Jack, has consented at the last minute to join me for the movie marathon, too. Should be fun, will report here next week on all the gory details. The sales numbers for the title are fascinating. Starting in 1976 (coincidentally, the year I got into comics), the numbers for paid circulation and subscribers grow by leaps and bounds until the peak year of 1983. The growth in these numbers from 1976 to 1979 is eye-popping. What factors went into this? Despite the occasional fill-in and clunker, the late 70’s was a strong period for the title. Young, rising stars like Perez and Byrne put in time on the book. Starlin’s Avengers Annual #7 really clicked with readers (and still does). It won 2 Eagle Awards in 1977. The beginnings of the Direct Market as well? There must be other factors I’m missing. I think you answered your own question — Avengers was a top-quality book in the late 1970s. I recall the book benefiting from frequent cross-overs with other titles, and I expect many kids of the day (myself included) saw Avengers as a chance to get a bunch of superheroes for one quarter, rather than having to pay just as much for a single-hero book. The article accompanying those sales numbers notes only that sales jumped dramatically in 1979, without noting why, but also says that sales declined after the readership was split with introduction of “West Coast Avengers” in the 1980s. I don’t remember much about West Coast Avengers but I have a vague sense that it was an inferior book that devalued the brand. Certainly those 1980s Avengers books didn’t have the “must read” feel of 70s Avengers, which really felt like Marvel’s “event” book. To echo Horace Austin, you do a very nice job of summarizing several issues worth of events in a concise blog. Good job! I’ve still got all those Korvac books — haven’t read them since they came out, I recall thinking the storyline overstayed it’s welcome, but I should give them another chance. So much to read! (I’m also hip-deep in a Batman run right now, preparing for a review to come out when Dark Knight Returns hits theaters later this summer). Yeah. 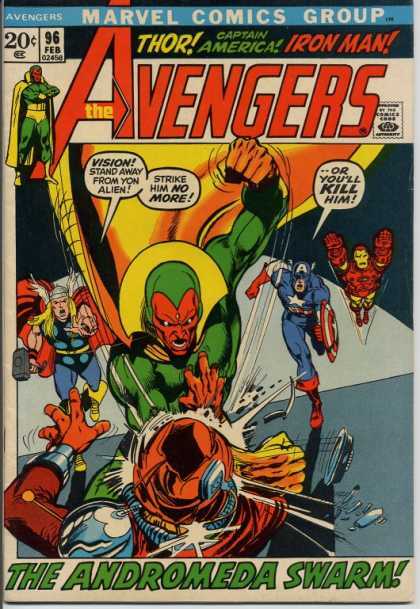 For most of the 1970’s, the Vision adorned the corner symbol on the Avengers comic book covers. I don’t have the letter columns close at hand to prove it but my memory of the era was that there were frequent calls for the Vision to have his own series. Marvel was wise to resist — the magic of the Avengers was in their ensemble nature, and it was always the characters native to that book (rather than outside headliners like Iron Man and Thor) who really made the series tick. Spinning Vision off on his own would have required that they develop a supporting cast and series of hooks independent of what made him work so well in Avengers — being the perpetual outsider, the objects of scorn and prejudice … the Vision was like all the X-Men in a single person. 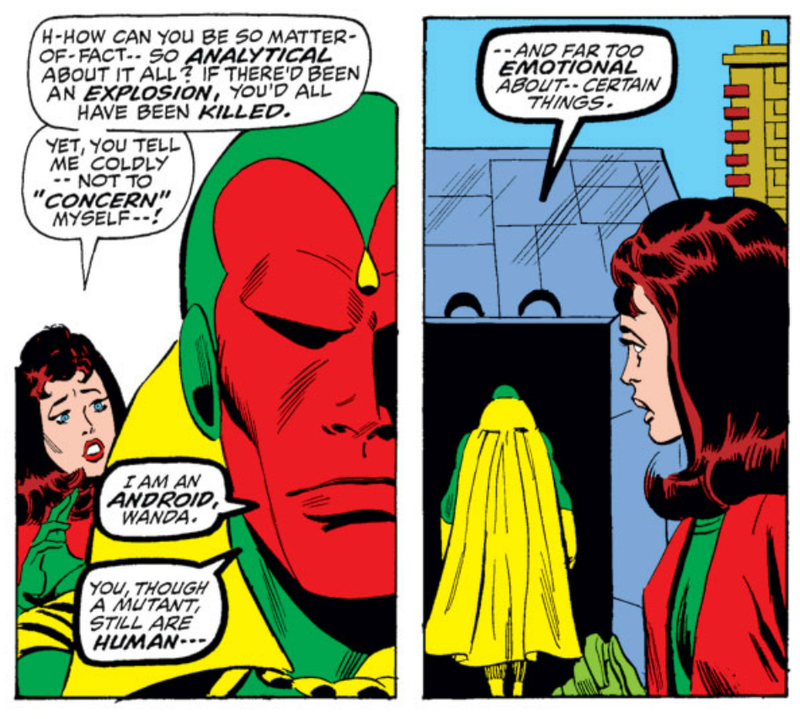 The Vision did get his own title in the Vision & Scarlet Witch mini-series but I don’t recall liking it much. I re-read the Korvac Saga, as part of my Avengers journey, and for me, it held up after all those years. I foud it touching that Korvac was essentially defeated by love. And I’m with Horace on Vision Quest. I like a lot of Byrne’s stuff, but not his Vision. I know what you mean, Paul. I’m re-rading through my old comics too (I wish I’d had the idea to right a blog about it but I’m probably too lazy anyway) and I’m a little over halfway through my Fantastic Fours. It seems like I might never get through all of them, plus I’ve been buying the occasional trade paperback. I am inching closer to a big Fantastic Four project. There’s no movie on the horizon to give me a deadline for the blog so I suppose I’ll just have to commit to it, maybe later this year. I’ve just about filled in the Byrne run. This blog does help keep me on track to read/organize/sell my stuff, and I’m glad it’s developing a little bit of community for folks who find it a worthwhile read in its own right. Thanks as always for reading and commenting. 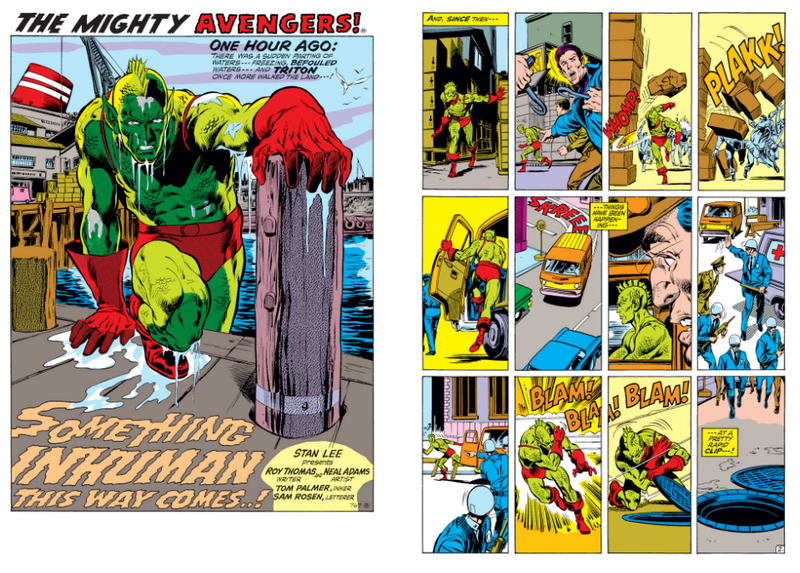 It’s good to review the Skrull history: This saga, when their homeworld got eaten by Galactus, and when they got frozen in whatever shape they had by the gene bomb – all classics. Many people are asking “What Avengers trades should I get?” because of the movie. 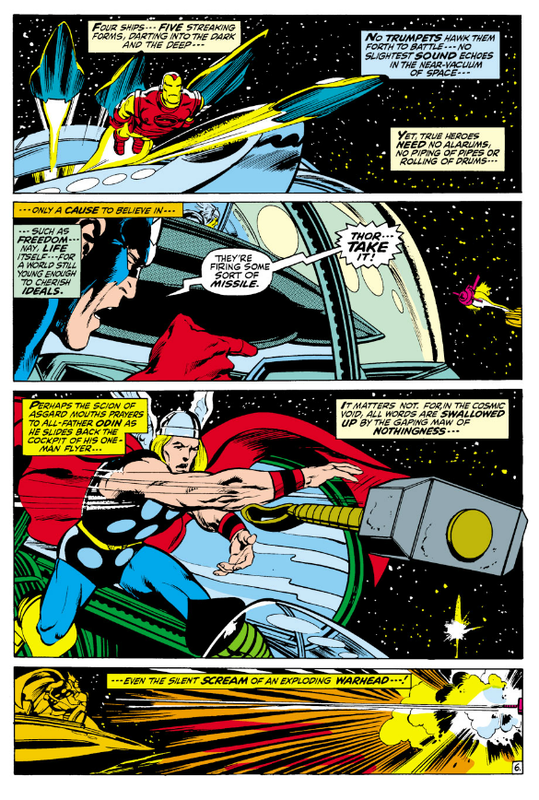 This story makes the cut, even if Marvel’s reprint cut out some of the early issues. Other than the Thomas/Buscema days, we also endorse Ultimates 1 & 2, the Stern/Buscema/Palmer run from the 80s, the “Red Zone” storyline featuring Dell Rusk from 2003, and the Bendis/Finch run on New Avengers. The Byrne and Perez stories had some real highlights, too – like the birth of Quicksilver and Scarlet Witch in the Wundagore story. I know about half of those, Mars, and will check out the rest. After seeing the film yesterday (review coming next week) I am still enthused for Avengers, and will likely do one more series review here at Longbox Graveyard, possibly to coincide with release of the DVD. A Skrull by any other name … I missed their name in the movie, and wouldn’t have connected it to Ultimates in any case. Good detective work, Mars! Now, if you want to drive hits for your excellent site, you should put up an info page on the mysterious villain we see at the very end of the picture — you and I both know who it was (and I am not naming here as the film is still rolling out and I don’t want to spoil the surprise), but I know you have the material on hand to do a full dossier on the guy and there will be plenty of casual fans out there wondering just who the heck it was …! Right you are! In fact, we got called out for saying it on our site last week and took down the spoiler. We read reports from Marvel fans that their friends have no idea who it is, and are saying things like, “Dude, it’s the Red Skull!” BBZZZTT No dice. Thanks for playing. In the past week the Avengers have gone from a private club of obsessives to a worldwide cultural phenomenon. Gonna be plenty of guys tromping through our clubhouse getting all the details wrong now! “Avengers” is suddenly the most lucrative superhero brand in the world — bigger than Batman, Spider-Man, X-Men, Superman. It’s a crazy world, my friend. I love cosmic comics (see what I did there?) — SIlver Surfer, GL Corps, Krees & Skrulls, the Legion, Adam Strange, etc … but I have not read many Avengers. 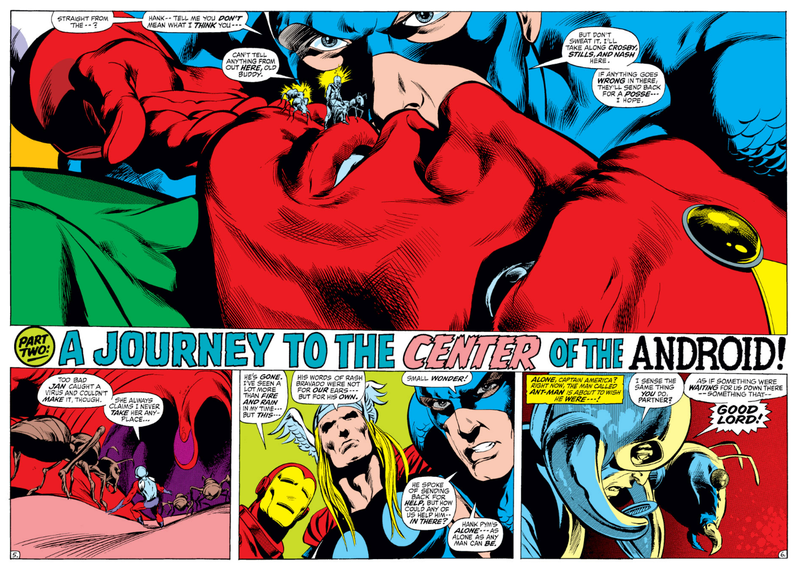 This is where my DC-centrism has certainly led me to miss some great stories, and Avengers has so much continuity, it is intimidating to know where to start. But with the existence of reprints / essentials / masterworks, the early issues are available. By nature I am an OCD-hindered completist, and would need to start at the beginning. Is Avengers worth the effort — considering it, or maybe FF instead. Advice? Personally, I think the Avengers are worth it (either they or the Legion are my all time favorite comic) but if you’re really into cosmic & sci-fi stuff, the FF might be a better bet. If you follow Thanos you’ll get the best of Marvel “Cosmic” stuff, for the most part, and plenty of Avengers along the way (and also Warlock, Silver Surfer, Captain Marvel, and the Guardians of the Galaxy). Mars Will Send No More has an excellent guide to Thanos; to dip your toe in you might try the recent Thanos The Final Threat one-shot reprint, which is one of my favorite Starlin Thanos tales (and half of it is an Avengers Annual, so there’s plenty of Avengers stuff too). Fantastic Four is more along the lines of “old school” Cosmic — the Galactus story, of course, sets the bar for all of Marvel’s Cosmic stories, and the Negative Zone stuff is pretty cool, but overall I like the FF tales less than the Starlin stuff from the 1970s and later (and it might just be down to being less enthusiastic about the FF, overall). On the DC side, I never much warmed up to their cosmic tales. Green Lantern Corps was OK, for awhile (and I like the animated show). New Gods was fun but flawed and of course cut off in its prime. I’m reading Legion of Superheroes Archives Vol. 1 right now and it is nostalgic and fun but very much a relic of the 1950s. Oh, I agree. I don’t like the FF stuff as much as the Starlin 70’s stuff. As far as DC, I liked the Green Lantern Corps stuff from the 80’s, but I absolutely love the Legion of Super-Heroes. It’s my all time favorite DC comic. However, I don’t like the warly stuff as much as the Bronze Age stuff, so if you’re reading vol 1, I’m not surprised you’re not blown away. It pick up when Jim Shooter takes over in the mid to late 60’s, but really hits it stride with Paul Levitz, so you may want to pick up Legion archives in the double digits rather than vol 1. I’m enjoying this first Archive edition just fine — my filters are set for “Silver Age Goofy” and by those standards this collection is a cut above. I love the Eisenhower-era rationality and safe atmosphere of these Superman Family titles. The stories are bright, clear, and optimistic, and it’s fun to watch the Legion characters in their first appearances. The Legion is (Mostly) a hole in my comics knowledge and I will gradually fill it in. I see Shooter comes aboard with the fifth volume in the Archives series so maybe I will jump ahead. I like all of the Legion stuff, but I definitely think it takes a step up when Shooter joins. Dunno, would be hard to top the story I read last night, where Krypto first assembles Beppo the Super-Monkey, Streaky, and Comet the Super-Horse to form the Legion of Super-Pets and rescue Superboy from the mind-controlling Brain-Globes of Rambat! Have you read the one where a villain switches Hitler’s, Nero’s, and Dillinger’s minds with Superboy’s, Mon-El’s, and Ultra-Boy’s? Classic Silver Age magic. No, I’ve been staying away from the New 52. The good news is Marvel released a collected edition with the entire Kree Skrull war run included, not just the last 5 issues. Not long after your blog post either. And let us know how the viewing of the animated Avengers – Earth’s Mightiest Heroes in going. I noted Netflix added season 2 recently so you can watch the complete run. Marvel/Disney is rebooting the series as Avengers Assembled. I’ve been filling in my missing Kree/Skrull wars with selected digital reads; the Marvel Digital library pretty closely shadows what they put our in collected form, in fact I think they send stuff to digital only after they’ve first formatted it for collection. The advantage to digital of course is that everything remains in print, something Marvel’s had trouble doing with their actual printed collections. We watched the first episode of Earth’s Mightiest but it didn’t spark. I will try again. Supposedly Young Justice and Green Lantern are starting up again so maybe I can sneak it into that rotation.